I am pleased to greet you on behalf of the National Cancer Center colleagues. As a national center, our aim is to constantly increase access and improve the quality of medical care and services that we provide, as well as upgrade our services to international standards. Also, we aim to implement a comprehensive cancer early detection activity that greatly increases the chances for successful treatment of cancer. Our doors are always open to our dear clients and guests. We are always ready and willing to help and collaborate with you and reflect your valuable suggestions in our work. Be a leader in providing professional medical services in oncology field through delivering friendly, equitable and quality services to clients at nationwide level. The National Cancer Center is the only state institution responsible for carrying out cancer epidemiology survey among population. Its underlying factors and provides services on early detection, prevention, diagnosing and treatment and simultaneously conducting cancer research and training for medical specialists. 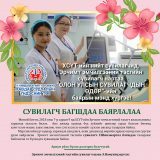 In 1961, the National Cancer Center of Mongolia was established according to an order N 24 of Ministry of Health with initial name of “Radiation therapy Hospital“ where 4 specialists from former Soviet Union and 5 Mongolian doctors were engaged with 45 inpatient beds of capacity. In 1982, a new construction of hospital was completed and since then inpatient beds and employees have increased up to 206 beds and 489 employees. Currently, the National Cancer Center has 12 units and 18 clinical departments with about 116 oncology doctors, 5 pharmaceutists, 242 nurses and other specialists including engineers, technicians, economists and ancillary staff. The NCC has such modern diagnostic and treatment equipments, such as CT, X-ray and angiography, mammography apparatus, digital ultrasound machines, endoscopy units for esophagus stomach, bronchoscopy, radiation therapy computerized planning simulator, Co-60 brachitherapy unit etc. Subprogrammes adopted by the Ministry of Health, have developed by specialists and doctors from NCC with technical assistance of WHO. 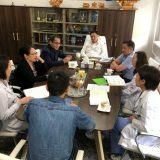 The National Cancer Center has cooperative relationships with Universities and Hospitals of Japan, Russia, China, Australia, South Korea, Singapore, Czech, Phillipine, Austria, USA, Canada, Switzerland, France. NCC implements joint projects, conduct trainings and exchange programmes with these institutions. 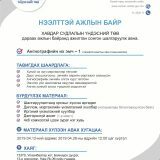 Эмнэлзүйн эмзүйч мэргэжлийн эмзүйн үйлчилгээ үзүүлдэг.